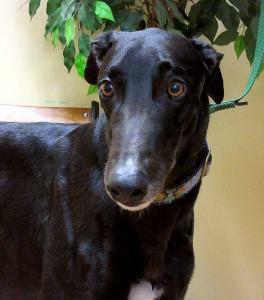 Coal is a gorgeous, extra large, black male that raced at 83lbs. He will turn 4 on June 16th. He raced 74 races starting in Birmingham then moving to Sanford Orlando. He was pretty good racing at the top A levels at both tracks. He had a bad fall on June 2nd 2014 in a race that resulted in a torn muscle in a back leg. His owner had surgery done on the muscle and kept him off until October to heal up. He healed up well and was quickly back up to the top A level again and raced well for another year. In September of 2015, he had a jammed ankle that forced him to take a few months off. During his time off the scar tissue from the old surgical repair stiffened up. When they started running him again in December he just wasn't able to get the extension he needed to win races. Both old injuries are healed and shouldn't affect him as a pet. They just took a second or so off his time that is the difference between winning and coming in last. Coal is a special guy. He was raised and raced by his owner and is considered a pet as well as an elite athlete. She would love to get updates from his adoptive family. Coal is a friendly boy that was always good in the kennel. He never had accidents in his crate and was a happy guy that everyone liked. Most of the time the bigger boys are kept in the lower crates at the track but Coal likes to jump up into the top crates so is the unusual male that was a top crate dog. His sire is Flying Coal City and his dam is Kentucky Merlot. More as we get to know him.